Guruvayoor Sree Krishna Temple is one of the most important and sacred pilgrim centres of Kerala located in the Guruvayur town of Thrissur district in Kerala.The presiding deity is MahaVishnu, in standing posture with four hands carrying Sankhu(conch), Sudarshana chakram,lotus and mace. This idol was once worshipped by Mahavishnu in Vaikunta. He is worshipped as Balakrishna, the full avatar (Purnaavatara) of Mahavishnu .The idol is made of a rare stone known as Patala Anjana.Guruvayur is called as the Bhooloka Vaikuntam as here resides Vishnu as Guruvayurappan, an idol believed to have been worshipped by Lord Krishna Himself. The eye-filling figure of Lord Guruvayurappan in the sanctum sanctorum is the full manifestation of Lord Mahavishnu as was revealed to Devaki and Vasudeva at the time of Krishnavatara.The glory of Guruvayur was revealed by sage Dattatreya to King Janamejaya , the son of Parikshit. According to the sage, the image of Guruvayur was originally worshipped by Narayana. 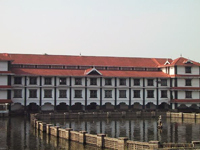 The temple is built in a typical Kerala temple architecture. Vishwakarma, the divine architect built the first temple here .The main entrance to the temple is through the eastern side. There is also an entrance from western side. The idol is visible from the main entrance itself. The Other Dieties : Apart from the main deity, the temple complex consists of Ganapathy temple, temples for Sastha & Bhagavati .The Ganapati shrine is situated within the Nalambalam itself at the south-west corner. The Sasta shrine is outside the Nalambalam on the south-east corner just inside the pradikshinavazhy . This is the only shrine outside the Nalambalam. The shrine of Edatharikathu Bhagavathy is considered to be in a separate compound with a small passage separating it with the main temple located on the left side.The idol made of dark granite is about a meter in height. A small deepasthambam is there in front of the shrine. Rudra theertham Lord Siva (Rudra) performed tapas and worshipped Maha Vishnu for years under the waters of the sacred tank located on the northern side of the present day temple and hence this body of water got the name of Rudra-Theertham. The pond outside the temple is very divine and it is believed that Lord Siva performed penance here and it is known as Rudra theertham. When Guru and Vayu were searching for an ideal place for the consecration of Vishnu's idol, Lord Siva allowed them to install it on the banks of Rudra teertham and Shiva moved a little further away, and gives his blessings, where we see the present Mammiyur Mahadeva temple . History : The Guruvayur temple is known as "Bhooloka Vaikunta",believed to be at least 5,000 years old and the main idol is believed to have been installed by Brihaspati and Vayu, and to have been blessed by Shiva and Parvati. The temple was built by Vishwakarma the divine architect. Over the years, Guruvayur increased in popularity, especially after 16th century when it became one of the most popular pilgrimage centres in Kerala.Many references about Guruvayoor can be seen in many works dated as early as 16th century. But it was Melpathur's Narayaneeyam that made the Temple famous.But there are no historical records to establish it. In the 14th century Tamil literature 'Kokasandesam', references about a place called Kuruvayur is made. As early as 16th century (50 years after the Narayaneeyam was composed) many references are seen about Kuruvayur. In ancient Dravidic, Kuruvai means sea, hence the village on the coast may be called Kuruvayur. The concept of Unnikrishna popularised by Poonthanam , Kururamma , and Villwamangalam brought more and more devotees to Guruvayur. Besides the main temple there are few other shrines in and around Guruvayur which are of interest to pilgrims since these are either connected with the main deity or have been its kizhedams or subordinate shrines..
Mammiyoor Temple - is just one kilometre from the Guruvayur temple. It is believed that a trip to Guruvayur is not complete , if one does not visit Mammiyur temple.This temple has Lord Siva as the main deity and there are shrines for Parvati and Vishnu , Ganapati, Muruga and Ayyapa. Narayanamkulangara Temple - This is also a subordinate shrine of Guruvayur and is half a kilometer to the north of Mammiyur temple the prathikshta here is the Goddess Narayani.She is otherwise Vishnumaya and famed as bestowing salvation on men.The annual temple festival here is conducted on the 10th of the Malayalam month of Makaram (January end). Tiruvenkatam Temple - Half a kilometer to the north-east of parthasarathi shrine is another Vishnu shrine Tiruvenkatam or Venkatachalapati of Tirupati. The general belief is that this Devi temple because only the image of Bhagavati on the south-east corner of the chuttambalam is what is worshipped now, the main deity Venkatachalapati- opposite this and facing east was the target of depredation of Tipu Sultan, it being disfigured below neck. Parthasarathi Temple - Situated a few meters to the north of the Manjulal on the east nada.Its a great temple and the beautiful idol of Parthasarathi (Sri Krishna as Arjunaâ€™s Charioteer).The celebration of the Gita day on Vrischika Ekadasi, (Sukla Paksha) is the important festival here.This also synchronises with the great Ekadasi festival of the Guruvayur temple. Thamarayur Ayyappa Vishnu Temples - There is a big shrine dedicated to Ayyappa which belong to the Thamarayur illam, situated 2.5 Km north of the Guruvayur. The Vishnu temple is known as Sreekandapuram Vishnu temple. These are on the way to Punnathur Kotta. Kaveed Bhagavathy Temple - This is one among the famous 108 Durga temples in Kerala. Bhagavathy is the main deity. It is situated at Kaveed, 6 kms from Guruvayur, near to Punnathur Kotta. Punnathur Kotta :- is located in Kottapadi, 3 KM away from the Guruvayoor temple a unique elephant sanctuary, the only one of its kind in the World. Punnathur Kotta is the ancient palace of the Punnathur Rajas.There is also an ancient temple where Lord Siva and Bhagavathy are worshipped. Elephants are trained here for purposes related to temples ritual offerings . The house currently has about 64 elephants. All of them came here as offerings by devotees of Lord Guruvayurappa. Gajapooja (Worshipping Elephants) and Anayoottu (Feeding Elephants) are observed here, as offering to Lord Ganesha.The 10 acre compound is open to public and you can watch them being fed and bathed. The visiting hours are 8.00 am to 6.00 am. The utsavam in Guruvayur is in the month of Kumbham (Feb-Mar) and the celebrations are spread over a period of 10 days. The festival starts with the hoisting of the temple flag on the dwajasthamba. 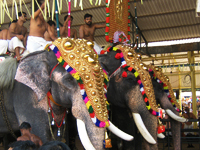 A special event during the utsavam is the elephant race. Ekadasi, the eleventh day of every lunar fortnight, is very auspicious to the Hindus. Of the 24 Ekadasis in an year, the Vrishchika Ekadasi (Suklapaksha) has got special significance in Guruvayur. It falls in the Mandala season. The Navami (9th day) and Dasami (10th day) are also very important.A highlight of the Ekadasi is the memorial honour for Gajarajan Kesavan . The Karanavar or head of the elephant family places a wreath at the statue of Kesavan in front of Sreevalsam guest house and all the other elephants stand around and pay obeisance. The temple is open at 3 am and closees after the day's poojas and rituals around 10 pm. Normally there are five poojas and three circumambulatory processions called Sreeveli, propitiating the celestial deities and carrying the Loard's Thidambu on elephant's back. During the days of Udayasthamana Poojas there will be a total of twenty one poojas. * The following timings given are approximate. It may vary if there is Udayasthamana pooja or on certain special occasions. 3.05 am to 3.30 am. 3.20 am to 3.30 am. The Sreekovil will be closed after Thripuka. Then the Krishnanattam, a colourful traditional dance-drama on Lord Krishna's life is enacted inside the Temple on specified days.